In the wake of the dramatic finale to Season 3 of The Flash, one thing has become readily apparent: Death is meaningless. Granted, in a show where time travel and alternate realities are a bedrock, it is a given that the past is easily undone, and it is no reach for doppelgänger versions of main characters to get murdered on parallel Earths at least once per season. But in this latest, “Finish Line,” the show might have quite literally crossed a line that has nothing to do with speed-related racing puns, and everything to do with making a fulfilling story with actual stakes. Spoilers for the fate of Central City and it’s Scarlet Speedster at the end of The Flash Season 3 follow. After an entire season in which Barry made one selfish choice after another, he finally took responsibility for his actions and accepted his fate as the new prisoner of the Speed Force. He basically walked through a portal to speedster heaven, holding hands with his long-dead mother, where he’ll be trapped for all eternity… or at least until Season 4. Barry walks into the Speed Force hand-in-hand with a manifestation of his dead mother. The Flash is a superhero show, which is a genre known for its casual treatment of death, which is always temporary. Just like the time Jon Snow died at the end of Game of Thrones’s Season 5, we all just sort of know that Barry will be back at some point, even if the show’s narrative wants us to pretend otherwise. Heck, there’s even a precedent in DC comics for the Flash dying in this way and returning from the grave. This entire season of The Flash also built up Iris’s death, showing it to viewers countless times, including a staged Lego instance and a fake-out version in the finale that was just H.R. in disguise. Between the prevention of Iris’s death and Barry’s inevitable return — along with perhaps a dozen other cases in the broader Arrowverse — the cycle of “fake” deaths is growing tired. Tom Cavanagh, for instance, has played a whopping seven different versions of the character Harrison Wells (including at least one controlled by Gorilla Grodd), three of which have died. The original Earth-1 Wells had his DNA consumed by Eobard Thawne, who transformed into the new Wells. That villainous version of the character disintegrated at the end of Season 1 when his ancestor killed himself. And in this most recent finale, H.R. heroically altered his face to look like Iris so that Savitar would kill him instead. It’s almost bewildering to think that the next season of The Flash will somehow still have Tom Cavanagh as a series regular. 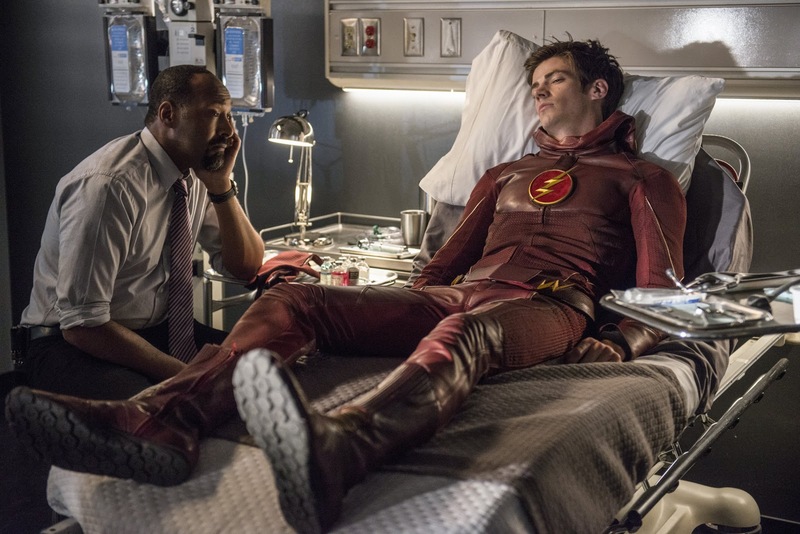 To his credit, Tom Cavanagh is an utterly fantastic actor who does a great job of executing the subtle differences across each incarnation of his character, but at what point do we just stop feeling a sense of loss when Team Flash will in all likelihood hold more interdimensional auditions for a new Wells? Within minutes of H.R. dying, Earth-2 Wells was back on the scene with his cool glasses and gravelly voice, promising to rejoin the team at the episode’s conclusion. The show doesn’t allow the viewer to grieve before moving along to the next iteration of time and dimension-related hijinks. Sure, there are characters that have legitimately died in the Arrowverse, but most of them get a lingering doppelgänger or time remnant that persists at one point or another. Eddie Thawne famously shot himself at the end of The Flash Season 1 to erase his time-traveling descendant, Eobard Thawne, aka the Reverse-Flash. Of course, because of quirky time travel mechanics, a version of the Reverse-Flash went on to terrorize the Legends of Tomorrow in Season 2, and even Eddie came back via Speed Force ghost visions and during a brief bout of time travel once or twice. In a similar fashion, Caitlin Snow’s husband Ronnie Raymond died around three times in the first season before it stuck. Even then, he returned as an Earth-2 doppelgänger, Deathstorm, and later as yet another vision inside the Speed Force. John Wesley Shipp plays both Henry Allen and Earth-3's Flash, Jay Garrick. Zoom also killed Barry’s father in Season 2’s penultimate episode. And at the season’s end, who was inside the iron mask in Zoom’s prison? Of course it was Henry Allen’s Earth-3 speedster doppelgänger, sliding neatly into the role of infrequent father-figure to Barry. But it’s more than just The Flash that likes to recycle its actors in death-defying ways. At least half of the Legends of Tomorrow have already “died” in some way, only to come back soon after. The death of each Lance sister on Arrow represented some of that series’s most emotionally potent moments. But Sara was revived in a magical pool of water and went on to lead the Legends of Tomorrow. And not only did a vision of Laurel return in the 100th episode as part of the 4-way crossover, but her Earth-2 doppelgänger debuted in The Flash before migrating back over to Arrow. Earth-1 Laurel Lance was killed by Damien Darhk in 'Arrow' Season 4. We’re led to believe that Barry walking into the Speed Force at the end of “Finish Line” is a noble and significant sacrifice. But with a Season 4 synopsis that blatantly remains remarkably similar to previous seasons, it’s impossible to believe that Barry Allen won’t be back on his own show within two episodes of Season 4, despite Barry asking Wally to take up the Flash mantle. The big cliffhanger at the end of Season 2, Flashpoint, was undone by the end of Season 3’s very first episode, so it’s almost guaranteed that Season 4 will do the same. With supposedly high stakes undone so easily — and so quickly — we’re at the point that all this death has become entirely meaningless. At some point, The Flash will lose its steam because of it.